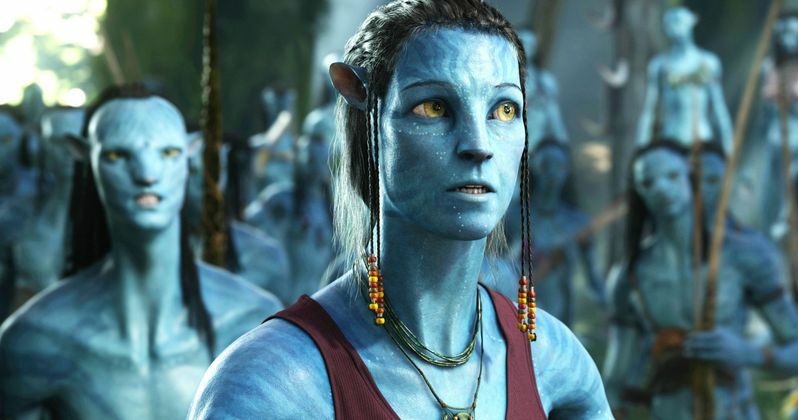 James Cameron has already started working on Avatar 4 and Avatar 5, according to Sigourney Weaver. The actress said, "I'm busy doing Avatar 4 and 5," after noting that she is finished with the second and third installments. Zoe Saldana finished filming her scenes for Avatar 2 and 3 back in June, and much like Cameron said from the start of this massive project about the filming schedule, they're already jumping back in to film the next sequels as the previous two go into the post-production process. In a new interview, Sigourney Weaver was asked about Avatar 2. Weaver starred in the first film as Dr. Grace Augustine, a human who sides with the Na'vi and loses her life during the conflict. It has been confirmed since 2014 that the actress will be returning for the sequel, but it isn't clear who she is playing. Weaver obviously couldn't go into details, but she had this to say when asked if her new character is the same throughout all four of the upcoming sequels. "It's a continuous character. We just finished shooting two and three. We shot it in LA and James has announced publicly that there's a lot of underwater work, so we learned how to free dive and we did many scenes underwater which was challenging and kind of cool." Sigourney Weaver was also asked if her new Avatar 2 character had any relationship to Dr. Grace Augustine from the first film and said, "no, not really," which only adds to the mystery of this new character that she is playing. The actress was also asked about how all of the sequels work together. James Cameron has compared the project to The Godfather trilogy in the past and Weaver reveals that all of the films can be watched separately, but they all work together as "a big saga." James Cameron, along with the cast and crew, spent months in the pre-production process for Avatar 2 in order to get the new underwater motion-capture method worked out. That is one way that the new set of sequels will revolutionize filmmaking, but Sigourney Weaver spoke about another way that the Avatar sequels will be groundbreaking. She had this to say when asked about why the sequels will impact the entertainment industry. "I think that because the water becomes another world. The scripts are amazing, and in the first one, which I love, I think he hadn't set up a lot of things. In this one he got to tell this very personal story. They're amazing. There's a message to not sacrifice everything for greed and conquest. It will take all four movies to really make that message loud and clear for the whole world." James Cameron had already been hyping Avatar 2 and the rest of the sequels, but Sigourney Weaver just revealed some pretty lofty goals pertaining to the story, which will be told across four films. Cameron is scheduled to release Avatar 2 in 2020, with the remaining sequels releasing in 2021, 2024, and 2025. You can read the rest of the lengthy interview with Sigourney Weaver over at The Hollywood Reporter.